Q. WHAT IS TEACHER ELIGIBILITY TEST ( TET EXAM) EXAM? WHY IT IS IMPORTANT TO BECOME TEACHER? ANS : TEACHER ELIGIBILITY TEST ( TET EXAM) EXAM PASS QUALIFICATION IS MANDATORY TO BECOME TEACHER AS PER NCTE GUIDELINES / RTE ACT. CENTRAL GOVERNMENT PASSED RTE ACT ON 23RD AUGUST 2010 IN ITS GAZETTE NOTIFICATION ( BHARAT KA RAJPATRA). Q. What should be qualification to become teacher under RTE Act for class 1 to 8. Ans: Minimum qualification is as per academic authority ( currently NCTE) authorized by central government of India by notification. NCTE prescribed compulsory TET pass qualification to become teacher under RTE. 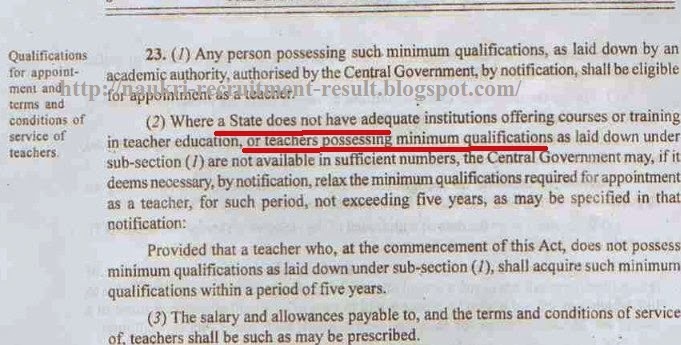 Provided that a teacher who, at the commencement of this Act, does not possess minimum qualifications as laid down under sub-section (1), shall acquire such minimum qualification within a period of five years. Q. Is there any specific guidelines/ rule for selected teacher under RTE Act? Ans: Teacher under RTE Act shall perform duties for educational purpose only. However they can be engaged in collecting population census data related matters, disaster relief duties and election duties. Q. Can teacher under RTE Act perform private tution . private teaching activity. Ans : RTE Act clearly denies for Private tuition/ private teaching activity. Ans : RTE ( Right to Education) Act OR Right of Children to Free and Compulsory Education (RTE) Act, 2009, is Eighty-sixth Amendment) Act, 2002 inserted Article 21-A in the Constitution of India to provide free and compulsory education of all children in the age group of six to fourteen years as a Fundamental Right in such a manner as the State may, by law, determine. The Right of Children to Free and Compulsory Education (RTE) Act, 2009, which represents the consequential legislation envisaged under Article 21-A, means that every child has a right to full time elementary education of satisfactory and equitable quality in a formal school which satisfies certain essential norms and standards.